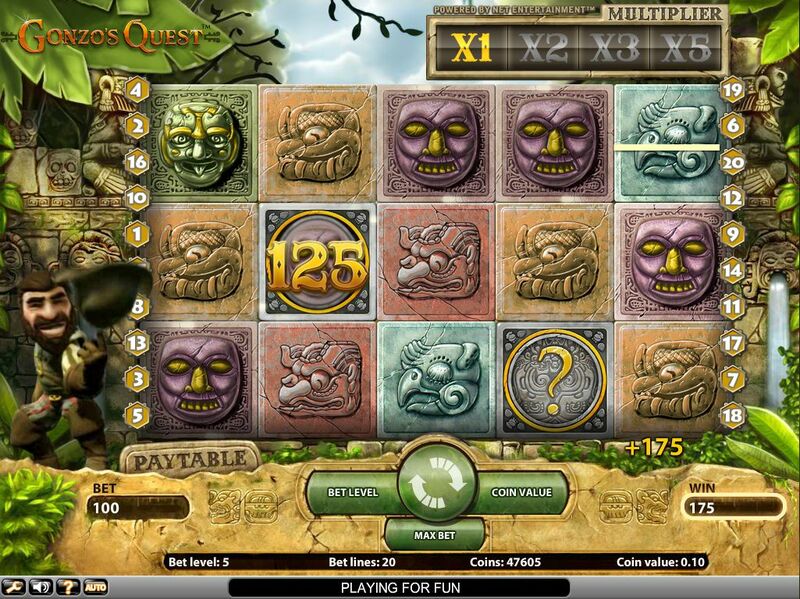 Play Gonzo's Quest Video Slot Machine Game for FREE! Where to Play Gonzo's Quest for Real Money? Gonzo’s Quest is one of the best slots ever produced by NetEnt, which is really saying something when you look at some of the other titles they are responsible for. The main reason for the high levels of excitement produced by this game is the theme, which follows Gonzo – who seems to be some kind of Spanish conquistador – as he explores the ancient ruins of South America. 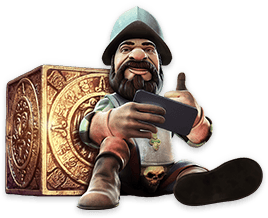 The likeable explorer is always found next to the reels, ready to cheer you on when a win spins into view, and players will certainly be amused by his antics. His little dances are a real highlight of this slot! The theme of the slot is further enhanced by the incredibly detailed reels, which feature symbols seemingly carved out of stone. All of them have mystical connotations, and explode whenever a win is spun into view – something that really increases the excitement. 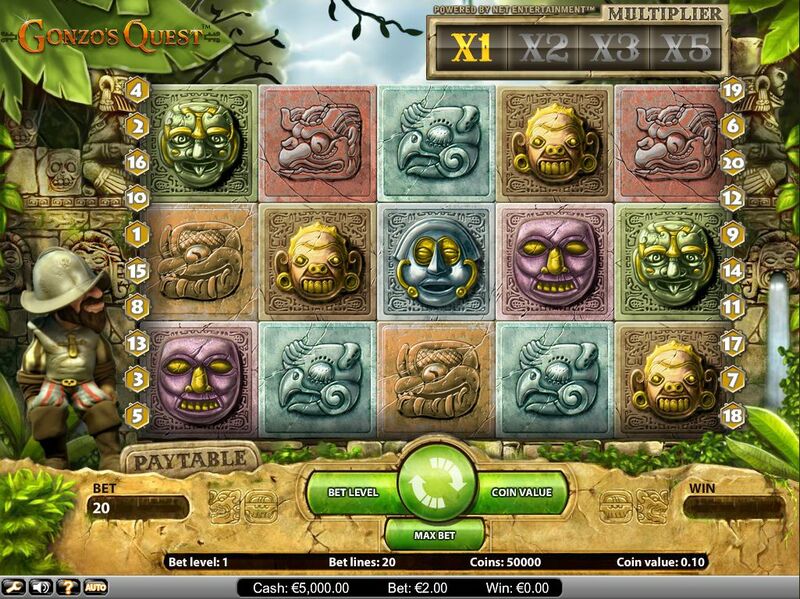 Gonzo’s Quest has also done something extremely clever with its theme, as it manages to use an Aztec/Inca setting, without making the game too similar to the many other slots also offering this theme to players. This means that it might be an old theme concept, but it still feels completely fresh when it’s played. 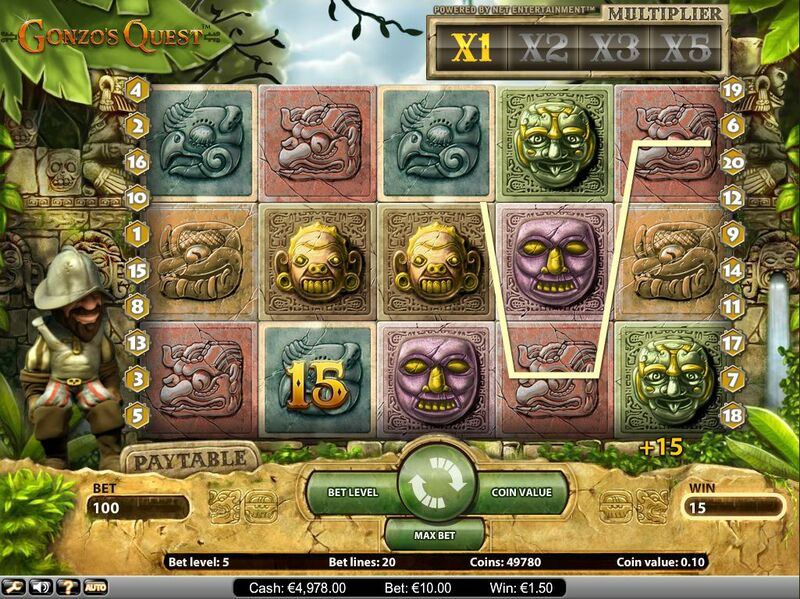 How to Play Gonzo's Quest Casino Game? 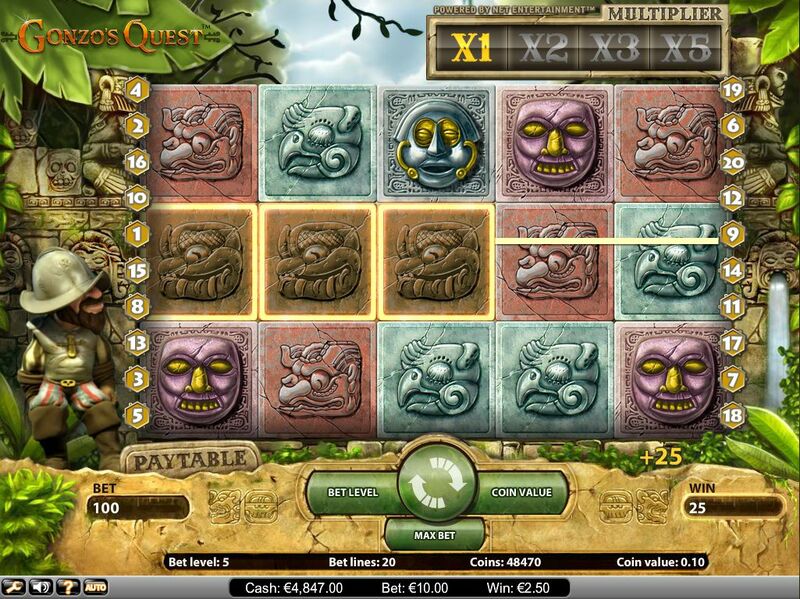 Gonzo’s Quest might be a slot with some unusual features, however it is also one that is incredibly easy to play. To get started, players will first need to choose how much to bet, however there is no need to choose the number of paylines, as every player is forced to play all 20 of them. Your bet can vary between just 0.01 per payline all the way through to 2 coins per payline, however you’ll need to multiply each bet by 20 to get the true amount of coins you are staking on each spin. Once this decision is made, the reels can be spun, before the amount you’ve managed to win is revealed. 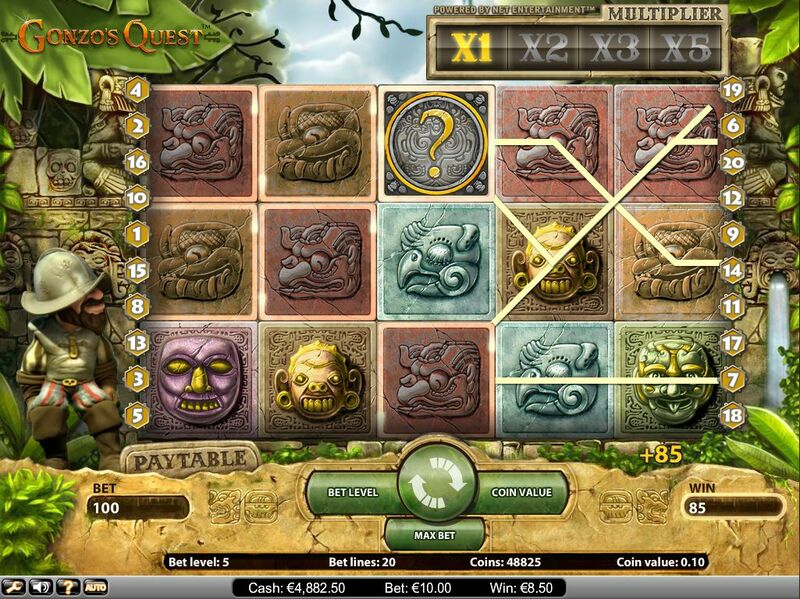 The most that a player can win is 100,000 coins, which is the equivalent to 2,500x the total bet, and is also a figure that exceeds the jackpots found at most other online slots. It’s more common to spin in smaller wins though, which will keep your account balance ticking over until a larger one spins into view. The simplicity of the gameplay just goes to prove that a slot doesn’t have to be complex in order to bring loads of fun to its players. At first glance, it doesn’t look like Gonzo’s Quest has too many bonuses and features, and this is actually true. The features that it does have though are absolutely superb, and lead to huge amounts of excitement on nearly every spin. 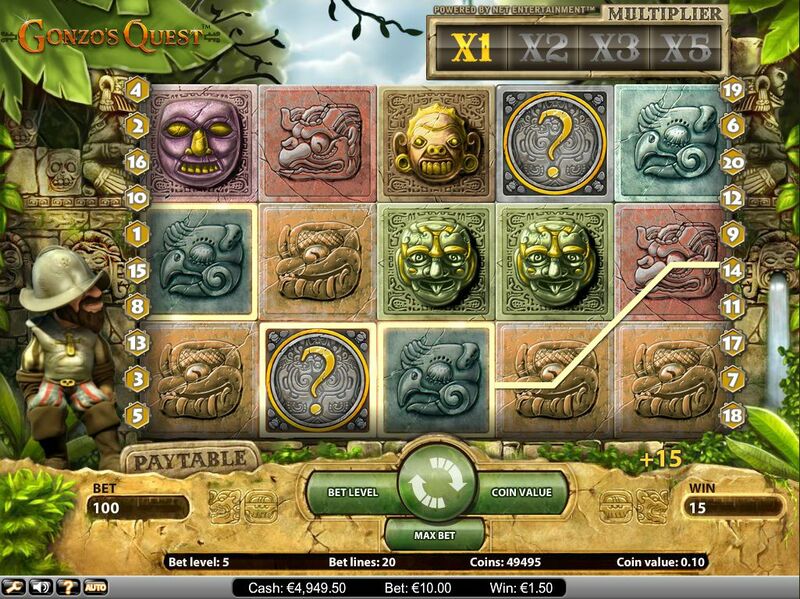 The main feature to mention occurs during the base game and comes into play every time you manage to spin in a win on the reels. When a winning combination is formed, the winning symbols will explode, and then get replaced by other symbols – meaning that you get the chance to form another win! What’s more, each successive win will lead to the multiplier increasing, with 5x being the highest that the multiplier can reach. It should also be mentioned that this slot has a wild symbol, and this can be used to form winning combinations at any stage of the game. There’s also another feature to look out for, and it is called the Free Fall bonus. This is activated when a player spins in three or more Free Fall symbols onto a payline. When this happens, the player effectively gets 10 respins of the reels. To make these even more profitable, the multipliers also go up, meaning that during the bonus game it’s possible to get a huge 15x multiplier on some of your wins. 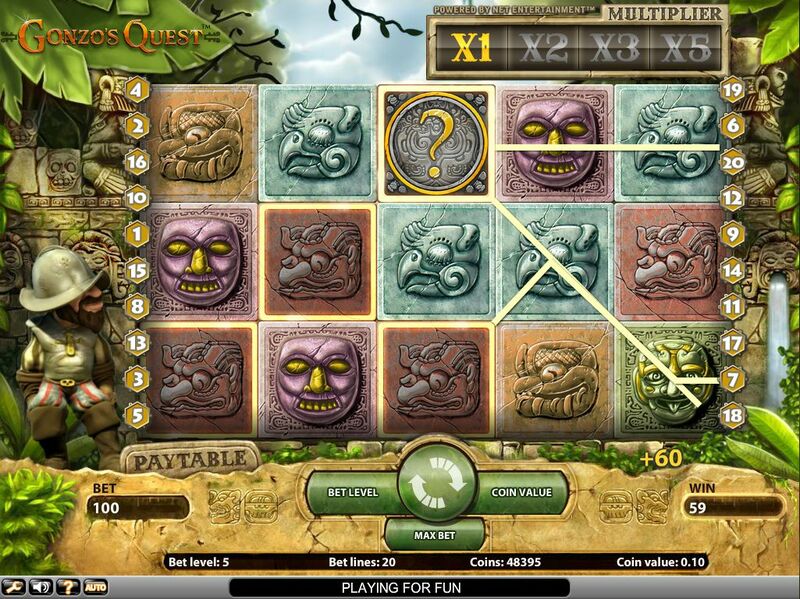 Once you have won on Gonzo’s Quest, there is no gamble feature to use, which shouldn’t upset too many players. This is because more experienced slots players will always avoid a gamble feature anyway. So, when it comes to Gonzo’s Quest, first impressions can be deceiving. Sure, this slot doesn’t have the largest amount of bonus features in the world, but the ones it does have are absolutely fantastic. This is one of the main reasons why Gonzo’s Quest is a slot that everyone should try as soon as they possibly can.